* Eddie Bauer black face field watch with French movement, waterproof to 150'. No scratch on crystal was $75 now $50. 34mm dial, 7mm thick. 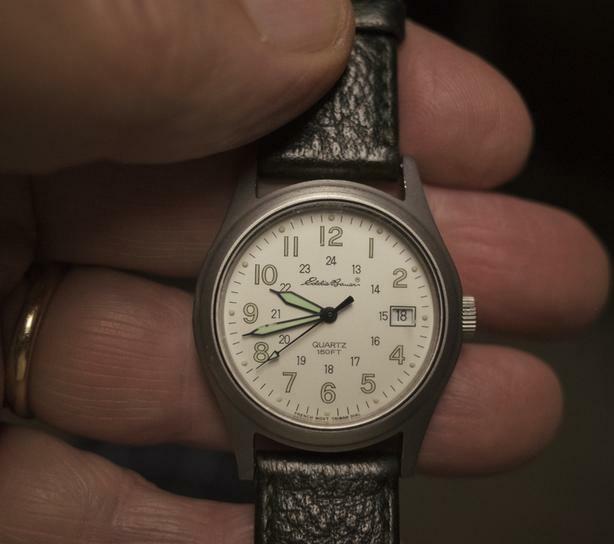 * Eddie Bauer white face field watch with French movement, waterproof to 150'. One small scratch on crystal was $75 now $50. 34mm dial, 7mm thick. * Swatch Skin Minyas small crack in crystal; works perfectly $30. 34mm case, 3.9mm thick. * Swatch Skin Night Slot - perfect crystal was $60 now $40. 34mm case, 3.9mm thick. * Swatch Blackout (black on black on black) $75 now $50. 34mm case, 8mm thick. * Universal Polerouter Geneve, very rare indeed--I've owned this since new in 1964 and *never* seen another like it. This is an automatic with the unique Microtor which enables the watch to be very thin and also very shock resistant. The first jeweller to clean and oil this watch offered to buy it from me, and I was offered €700 by a watch shop in Amsterdam last year, so I presume that's a wholesale value. I know I have seen distinctly inferior models of Universal Geneve sell quickly for $1250 USD. These are appreciating rapidly at the moment, so I'm asking $1250 CAD. This one is not reduced; I'll keep it over the others. This is the most 'timeless' (cough) Polerouter design I have seen--the simplest and most elegant. 34mm dial, 7mm thick.